So, an end of tour show for Thunder and The Quireboys. I'd been disappointed with both bands when they supported Alice Cooper, but I suspected that was mostly due to Wembley's awful acoustics, and sure enough, both bands wre much, much better tonight. This was the first time I'd been to the new Marquee, and while it was an OK venue, it was too open, and too bright, and lacked the atmosphere of the old venue. Both bands were much more enthusiastic on a small stage, the sound was better, and both bands put on an excellent show. I'd heard of Griffin through the Sinergy message board, but didn't know what they sounded like. As it turned out, they were quite good, and although I won't be following their every move, I'll go and see them if they play in London again. Sinergy came on stage to the sounds of Kool And The Gang's "Celebration". A little bizarre, but as Kimberley said, she wanted to hav ea little fun. It's a shame the sound quality wasn't better, as I suspect Sinergy would have been excellent, rather than just the good that they were. They got off to a bit of a shaky start, and the crowd weren't really getting into it, but things swiftly improved, and even the material from their comparatively weak new album, "Suicide by my side" came over very well in a live setting. I wasn't sure what to expect from headliners Dark Tranquillity. They've done a range of stuff, some of which I liked, some I really didn't, and some about which I was just ambivalent. Unfortunately, I don't think they really work as a live band, and for the most part I was unimpressed. They were monotonous, and lacking anything to maintain my interest. There were some signs of improvement in the form of a couple of the tracks from "Haven" which were performed better than the rest. There was also the curious exception of "Punish my heaven" which stood out as easily the best track of the night, and signifcantly better than the rest of their material. Dark Tranquillity may have had the best track of the night, but overall honours for band of the night go to Sinergy. 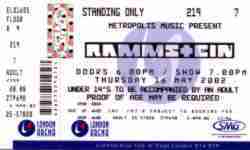 Although originally due to be at The Mean Fiddler, this gig was moved to the main Astoria, apparently because of high demand for tickets. I'd never heard of openers Blackshine until tonight, but they put on quite a presentable performance. Kind of like a more melodic Motörhead. Despite being billed as a Sentenced show with Lacuna Coil supporting, tonight was the other way around. I'm assuming that's because Lacuna Coil have sold more records in the UK, but whatever the reason, it meant that Sentenced were the next band to play. I've always been a bit indifferent to their earlier material, but tonight was very, very good, with some strong songs from their latest album "The cold white light". Lacuna Coil were much as I expected them to be. The material from "Comalies" came across better live than I think it does on CD, and the older tracks went down well. Not as good as their Borderline performance, but better than when they supported Dimmu Borgir. In time honoured rock 'n' roll tradition, the original Saxon lineup split, and the two parties both tried to claim the name. That resulted in the situation here, where one half is playing under the name "Oliver Dawson Saxon". Sadly, though, they have none of the professionalism, and none of the stage presence of Biff's Saxon. In fact, OD Saxon look more like a parody of an aging metal band than they do the real thing. Kind of like a mix between Spïnal Tap and Bad News. The music is adequate, and the crowd seem to like it, but for me me it was just a bit lacking, and I'm afraid that in my mind, Saxon will always be Biff. So on to Dio, who I'm convinced has now reached a fixed age and stopped. He hasn't aged at all since I last saw him. He bounds around the stage with endless energy, and his voice is as strong as ever. While he'll struggle to repeat the glories of his first few solo albums, the last two are certainly a step in the right direction, and once again, he put on a strong show tonight. New guitarist Doug Aldridge has some pretty big shoes to fill, and manages to do so pretty well. I don't think he's quite as good a guitarist for Dio as Craig Goldy was, but an admirable performance nonetheless. 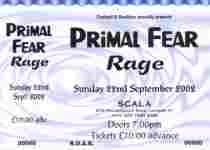 I'd been particularly looking forward to seeing Rage. Not only have I liked the band for ages, but they're touring in support of probably their strongest album to date, "Unity". Consequently, it wasn't a huge surprise that they put on a great live show. All three band members are outstanding musicians, and that showed tonight (although I wasn't too keen on the excessive soloing). My only criticism was that they sounded a bit thin at times. While Victor was able to hold his own, and make an impressive amount of noise from a single guitar via the use of various effects pedals, I just felt that a second guitarist might have improved things a little. But that's not to take away from a great performance, with highlights being "All I want", "Down", and an excellent "Higher than the sky" in the encore. On the basis of the two times I'd seen them previously, Primal Fear had earned the distinction of being the best live band in the world at the moment in my mind. Sadly, though, tonight's performance didn't match up to the awesome displays they'd previously delivered. It wasn't a bad show by any means, but perhaps my expectations were just a bit too high. Starting the set with "Chainbreaker" was a definite mistake, though. If they weren't going to open with a track from "Black Sun", then to choose anything other than "Angel in black" is bordering on the criminal. Still, that came later, along with all the other favourites (but still no "Into the future"!). A good night of metal, then, but against the odds, I think Rage were the better band on the night. 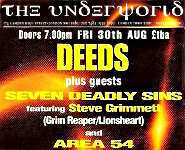 Openers Seven Deadly Sins are the latest vehicle for Steve Grimmet, former frontman for Grim Reaper, Onslaught and Lionsheart. Now I've been to a lot of gigs. But this is the first time I've been to one where the band outnumbered the audience. At the start of Seven Deadly Sins' set, there were 5 of them on stage, and only 4 of us in the "crowd" (and I'm fairly sure two of those were with the band). What makes it worse is that they're a great band, who really deserve to do well. Fortunately, a few more people arrived throughout the set, but in many ways, it made me feel ashamed of the London rock scene. Surely we should be able to turn out to show our support for bands, even for a poorly promoted show like this one? Anyway, I can't recommend Seven Deadly Sins highly enough. If they're playing in your area, then go and see them. In addition to their own strong material, they threw in a cover of Grim Reaper's "Rock you to hell". 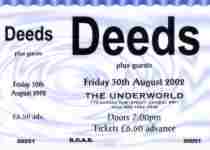 Deeds are for some reason no longer dirty. Perhaps to avoid being mistaken for an AC/DC tribute band? Whatever the reason, they're still a great live band. New guitarist Richie Faulkner acquited himself very well, and is a welcome addition. Furthermore, the material from the new album is pretty strong, too. A great night, but it's just a shame more people weren't there to see it. Six bands at an outdoor bike festival. Openers Saor Patrol consisted of a piper and four drummers. Not too bad, but it gets a bit wearing after a while. Fortunately, they didn't drag their set out too long. Riffmaster General started the main procedings off with a competent, but not particularly inspiring performance. Girlschool, on the other hand, were much better. There have been a few exceptions, but in general, I've found them to be a bit nondescript on their studio recordings. Live, however, they're an entirely different proposition, and I was very impressed. Next up were Blaze, who once again put on a great performance. There's little I can say about them that I haven't already said in previous reviews. It's nice to see them play in front of a sizeable crowd. I'd always thought Rose Tattoo a bit lacking in substance, and tonight's performance did little to alter that. There was nothing bad about them, but nothing to maintain any level of interest either. Headliner Doro once again impressed. Although lacking the energy of her London show (probably due to the difference in venues), she was nonetheless on good form. My only complaint was that her set seemed very short for a headlining act. I don't remember much about Firefly, other than that they weren't bad. Obviously not that memorable, though, either! The only thing I'd heard about Seventh Harmonic was that they had the French barmaid from the Devonshire Arms (whose name I can't remember) on vocals. Either that was a completely false rumour, or she's left the band. Whatever, she wasn't on stage tonight. What we did get, though, was a female three piece playing a fairly lightweight and occasionally off the wall ethereal set. Not bad, but not particularly inspiring live, and the material is perhaps better suited to studio recordings. I went to this gig to support a friend, Rose, who is the (relatively) new keyboard player for Waterglass -- which I found out thanks to Matt literally carpet bombing our party with flyers :-) Sad to say, but to my ears, Waterglass are yet another band desperately in need of a new vocalist. True, her voice did get much better towards the end of the set, so maybe it was just a temporary blip. Musically, they're not really my sort of thing, sounding a bit too washed out and lacking power for my tastes. However, the audience generally seemed to like them, and it was a successful launch party for their new album. Labrat. Ermm.... interesting. I thought it an ominous sign when the bassist was wearing an Akercocke T-shirt, and sure enough I was proved right. Imagine if you will a bunch of random people handed instruments and put on stage and told to play. Add to the mix a "vocalist" who literally just screams, not even making the token attempt at growling so prevalent among most of today's bands. There you have Labrat. Almost comedic, in a Wayne's World kind of way, but in terms of a live experience, they're right up there with Fony, Godflesh, Defenestration and Sona Fariq at the top of my list of bands to avoid seeing again. Rockbitch were much better, but then again, pretty much anyone would seem good following Labrat. Musically, they seemed better than the previous times I've seen them, but I still feel their repertoire consists of a bunch of average songs, one awful song ("Situation normal"), and one very good song ("Tic Toc"). If they'd write more songs like the latter, they'd be a much better band. Raging Speedhorn are one of those bands I'd read about, and was aware of the name, but had no idea what they sounded like. Given how frequently they're mentioned in Kerrang!, I wasn't expecting much, but I wasn't expecting them to be as bad as they were. Tuneless noise, with unintelligible barking vocals. As if the vocals weren't bad enough already, they felt the need to employ two vocalists, for added effect. Truly awful. I had heard some of American Head Charge's material before, so I knew pretty much what to expect. They weren't good either, although following Raging Speedhorn almost certainly made them look better than they actually were. But the supports weren't why I was there, and eventually, the opening strains of "Mein herz brennt" blasted out from the PA, pyros detonated, and Rammstein hit the stage. The set list and the effects were pretty much identical to when they played at Brixton. However, for some reason, they didn't seem to have the same intensity that was present last time. The pyros were bigger, to make use of the larger venue, but there seemed to be fewer of them. The lighting was better, though, probably the most impressive use of lights at any gig I've seen. Although it didn't quite match the high standards of Brixton, this was far from a bad show, and still probably the best concert I've seen so far this year. The highlight track was a spine tingling "Links 2 3 4", and "Feuer Frei!" also had the same effect. I hadn't heard anything of Bonfire since nearly a decade earlier, and didn't realise they were still going. I'm glad they are, though, because tonight they put on an amazing show. I'll definitely be seeing them again next time they play anywhere near London. 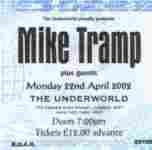 Mike Tramp is the former lead singer of White Lion, and one of only 3 Danes to have any significant impact on the world of rock (the other two being Lars Ulrich and King Diamond). I last saw him performing with White Lion in 1990. Part way through the set, he was reminiscing about his career, and said "the hair may be shorter now, but the rock's the same". Well that's not quite true. While he certainly was putting everything into the music, it was still lacking the energy that they had a decade earlier. Still, there was plenty of strong material on show tonight, such as "Wait", "When the children cry", and tonight's highlight by a significant margin, "Broken heart". I was suprised not to hear "Radar love", though, and disappointed, but not altogether suprised that we didn't get "Lights and thunder". A great evening, then, although I have to say that Bonfire were the better band on the night. Area 54 are desperately plugging themselves everywhere they can, and have landed numerous support slots. This is the fourth time I've seen them, and although they've never been particularly inspiring, they're definitely improving, and I think this was probably the best I've seen them. If they continue in the same direction, they stand a reasonable chance of getting somewhere. Love/Hate were one of those bands that I thought never quite got things right first time around. They had a few notable tracks, such as "Blackout in the red room" and "Wasted in America", but on the whole the rest weren't up to the same standard, and tonight just reinforced that. The above mentioned tracks were indeed good, but the rest were merely average. Jizzy Pearl is an accomplished front man, though, and I feel he deserves more success than he's received, even if he can't trim his beard to be straight :-) One other notable appearance tonight was hired gun guitarist Keri Kelli, who seems to be playing for half the bands I see these days! Gilby Clarke, one time guitarist with Guns 'n' Roses, is one of those artists, that I've been aware of, but never really heard much of their material. Tonight he proved himself to be more than capable, and his time in G'n'R has given him an above average stage presence. Not being familiar with the material, I was nonetheless impressed by the set, with notable tracks including a cover of "Knocking on heaven's door", and one of his own called "Tijuana jail". I'd been wondering why I continue going to see Iron Maiden. As a live experience, they've been getting progressively worse every time I've seen them. As is usual for a Maiden gig, the sound quality was awful, with the bass being mixed way too high, and the vocals too low. At times, I could barely hear Bruce at all, and if I hadn't known the songs, I wouldn't have been able to tell what (if anything) he was singing. But oddly enough, tonights show bucked the trend somewhat, and they were significantly better than the last few times I've seen them. Not as good as when I first saw them, or when I saw them with Blaze, but a definite improvement, and easily the best I've seen them since Bruce and Adrian rejoined the band. They still bias their live set too far in favour of the new album, but I think it was less obvious than on previous occasions. Of the classic material, "Number Of the Beast" was well represented, possibly because tonight was a benefit gig for former drummer Clive Burr, and that was only album on which both he and Bruce played. However, there was very little played from the other albums, with the first two albums, "Piece Of Mind", "Powerslave" and "Seventh Son" only having a lone track played from each, and "Somewhere In Time" being completely unrepresented. So, a better set list, but still with plenty of room for improvement. Equally, the performance was better tonight, but again there's potential for improvement. Highlight of the show was "The trooper", and had the sound quality been better, I'd probably have added "Children of the damned" and "Fear of the dark" to that. They have much to work on, but this is a definite step in the right direction, and enough to convince me to see tham again in the future. Cyberya are a rare occurrence in two respects. Firstly, they're the only metal band I can recall seeing that don't use a live drummer. Secondly, they're a support band that not only had I not heard their material before, but I hadn't even heard of the band at all, yet came away impressed. They play an odd mix of electronic metal. The closest I can get is that this is what Rammstein would sound like if they played power metal. An excellent start to the night. Axxis are a band I hadn't really heard of since the late 80s, when I'd heard (and liked) "Kingdom of the night". I vaguely knew they were still around, but due to the woeful lack of rock press or radio in the UK, that was pretty much it. As with Cyberya, they put on a strong performance, and I was very impressed. I just wish they could have more exposure over here. 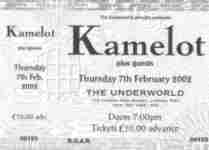 Kamelot were something of a surpise. While I'd liked their studio material, I'd always felt it was a bit washed out, and lacking substance. Live, however, they are a totally different band. They've managed to find a heaviness that's competely absent on their CDs. A vast improvement, and a great show. If they can find a way to harness their live sound in the studio, they would have an amazing record on their hands. I still feel that while Roy has a great voice, he doesn't necessarily have the power behind it to do the band justice. However, that didn't really detract from the show, and overall, an excellent evening, with strong performances from all three bands. I was surprised about the choice of venue for this one. I wouldn't have expected the Toilet Boys to be able to fill a venue the size of The Garage, and I'd have expected The Underworld to be a more suitable venue. Sure enough, Suicide Milkshake took to the stage in front of an almost negligible crowd. Sound quality was pretty grim, but towards the end of their set, it seemed to improve, and they were actually quite passable, albeit not particularly memorable. The same could be said of Sonic Boom Boys. In fact, they were sufficiently unmemorable that I can't remember anything much about them, other than an impression that they were more professional than the openers. By the time the Toilet Boys took to the stage, the venue had filled up considerably, much more than I had expected. Last time I'd seen them, they'd set the venue on fire with their pyrotechnics, and the building had to be evacuated, so I was hoping to avoid a repeat tonight! Musically, they were much the same. Significantly better than the two supports, with more energy on stage, and generally better stage presence. And then to the pyros... the initial ones from the ends of the guitars went down well enough, but by the time they tried to do their firebreathing, security had decided that enough was enough, and were covering the band in a cloud of CO2 in the hopes of extinguishing the various fires. Despite that, Sean did somehow manage to breathe fire over the audience, but the band were ushered off stage and that was the end of the show. An eventful night, then, and although they didn't manage to actually set fire to the venue this time, it certainly wasn't through lack of trying!